As we know very well pet dogs are our first "baby". 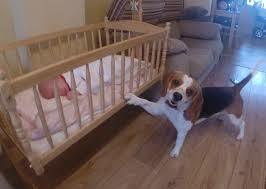 Most of the dog owners are very much worried about their pets, if they are about to bring a new born baby to their home. Even some of he owners tend to get rid of dogs because of fears that they will harm the baby.Don't do this unless you are aware that if the pets when treated and trained properly, can handle life with a newborn very well. While most dogs will be very gentle with the baby, many dogs do not see babies as humans because of their size, smell, and the strange noises they make. By taking the time to give your dog some extra love and attention he should be fine and not turn to bad behavior to get your attention. You need to prepare and educate your dog for what lies ahead. This will ensure that they are ready and willing to accept the new family member with open and loving paws.